On Sale Now! Free Shipping Included! 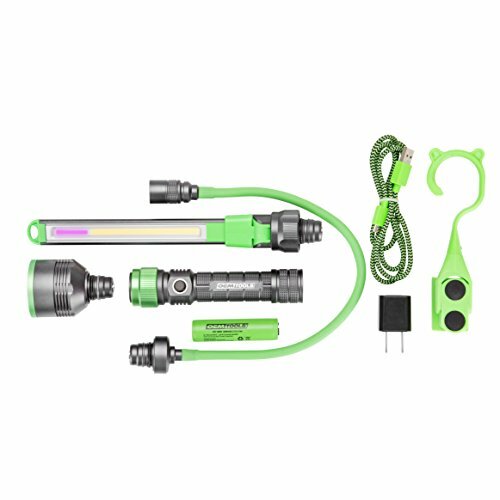 Save 3% on the OEMTOOLS 24648 Modular Work Light All-in-One Flexible Extension UV Inspection Attachment Mechanic’s Rechargeable Lightweight Drop Resistant Flashlight by OEMTOOLS at N Online Agency. MPN: 24648. Hurry! Limited time offer. Offer valid only while supplies last. End the struggle to light your workspace — the OEMTOOLS 24648 Rechargeable Multi-Head Work Light Set is designed for functionality and ease-of-use. End the struggle to light your workspace — the OEMTOOLS 24648 Rechargeable Multi-Head Work Light Set is designed for functionality and ease-of-use. This multi-head work light with magnetic base features a quick-release coupler, so you can effortlessly change between lighting accessories. The powerful 350 Lumens Flashlight attachment has a 150m beam distance and is drop resistant to 1m. Stuck in a tight spot? Pull the quick-release coupler to detach the flashlight, and snap in the 15" Flex Light attachment. The flexible extension lets you maneuver the focusing lens through small passageways to get 180 Lumens of light where you need it. The dual function inspection light attachment has a max output of 350 Lumens and features a UV setting. This all-in-one work light set includes everything you need—from everyday tasks to A/C leak detection. This kit includes a rechargeable lithium-ion battery, USB charging cord, adapter and a magnetic 180° Swivel Hook for hands-free operation. Check out the optional 24648E Work Lamp Attachment for a 350 Lumens Lamp that is compatible with the 24648 work light. VERSATILE: This handy, multi-head modular light offers the multi-functionality of a flashlight with a detachable 15" flexible extension for maneuvering narrow spaces, plus an ultra-slim inspection light with white LEDs and UV LEDs for lead detection - all in one easy to use work light that is lightweight yet durable and powerful, with a magnetic base so you can work hands-free and a 180 degree swivel hook so you can easily position it where you need light. EASY TO CHANGE: The quick-attachment coupler makes it so easy to switch from flashlight to inspection/UV light to flex light attachment, you can do it effortlessly with one hand! Just pop out one attachment and insert a different accessory, then repeat as needed with any of the multiple attachments. RUGGED: The compact, anodized aluminum body is water resistant and impact resistant to 1 meter. POWERFUL: Maximum output: 350 lumens (flashlight and inspection light), 180 lumens (flex light). Maximum run time: 2 ½ hours (in all light modes). Beam distance 150 meters (flashlight), 24 meters (inspection light), 23 meters (flex light).